I intended for this venue to be light and lovely. Mostly photos of the pretty things surrounding me along with some verses and sentiments that flow around in my thoughts. Maybe what I am writing is too sad or too personal or too revealing. The beauty of my simple life is that I have time to feel deeply and ponder long hours about those feelings. I have become very aware of the negative thoughts and behaviors that cause problems for me. I know why I feel most of them. I can identify the voice, time, place that first produced the injury to my being. Most times the voice is my own. I have worked very hard to undo the damage I have done to myself. He is always near to help me. He supports me in ways no one can guess. He told me this evening to get busy “orchiding”! He knows how important this commitment is to me and encourages me to continue. I am in the midst of a battle. The dragon of despair threatens to burn down the castle. I am fighting back. But, I am weakening. I cannot find a specific issue or group of issues causing this battle to be waged. I am feeling past grief pain well up in my heart. I am out of focus with my intentions. But, I am making progress. I have completed a picture. Acrylic on canvas: Lunar Color 1 is the title. 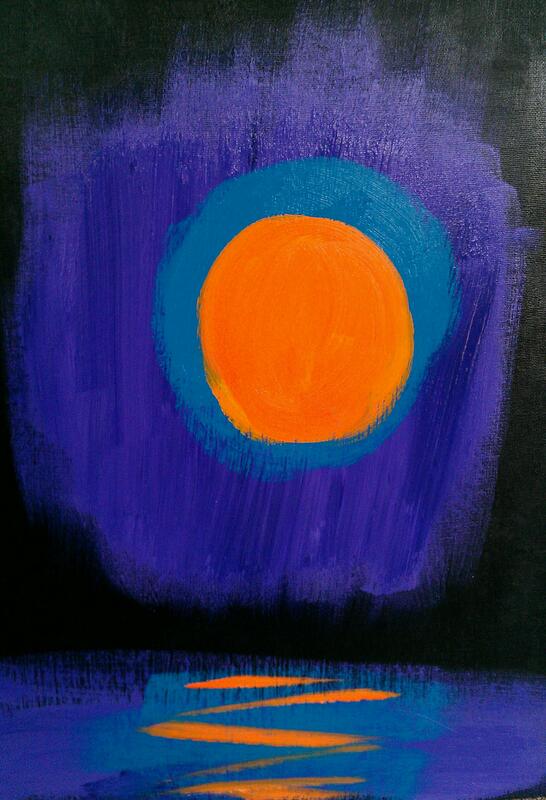 I ambitiously number it “one” because I intend to create more moon paintings. Full moons are one of my favorite things. Why do I love the full moon? 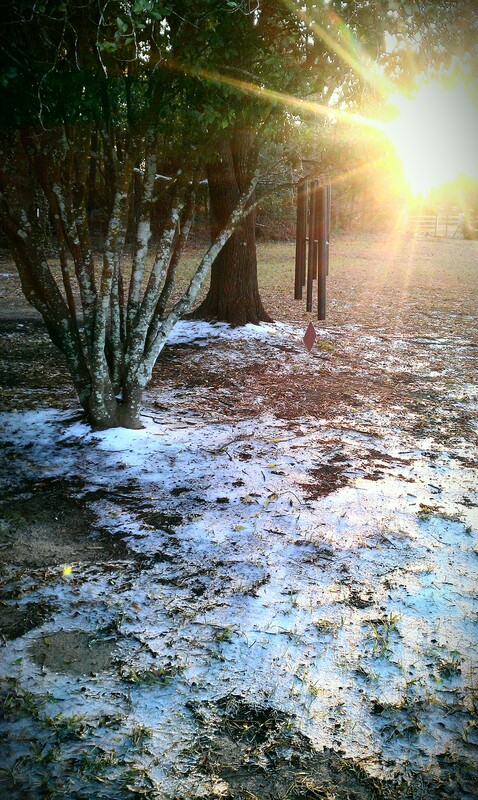 The seeds were strewn. The frost has prepared them. The sun’s return is near. The eternal promise of renewal is kept. My life is sometimes too simple. Translate: boring. With no one left to take care of anymore except him, I end up with a lot of time on my hands. I still have plenty to do. My nine-to-five takes up most of Monday through Friday. I cook a meal most evenings. There are dogs and fish and a cat to see about. Housekeeping and gardening and washing take place. But none of that takes all my time. The weekends are usually busy, but not overly. I have time I could spend doing rather than piddling. But what do I do? What do I want to do? I have some ideas. But, giving myself permission to do what I want to do appears to be the hurdle. I have trouble letting myself do certain things. Things I consider self-indulgent. Somehow, sitting in the chair playing on my laptop surfing Facebook or Pinterest seems okay. Sitting in the backroom trying to work out a problem with paint on canvas or with thread and trinkets does not. Why? The first action requires little concentration. It is something that doesn’t produce an end product that must be dispositioned. It does not require continued acquisition of materials and supplies. It does not need to be explained. The second action does all of that. Further, the second action forces me to take risks with my skill and ability to bring into reality something I have imagined. Frivolity in creative pursuit is not something I was encouraged to do. Sewing should produce wearable clothes. Quilting should produce useable quilts. Cooking should feed as many as possible with as little waste as possible. Trimming the crusts from bread was sacrilege. Painting on canvas was an indulgence for wealthier people. Mama did not mean it the way it worked out in my mind. But, it is there. I put my life on hold a long time ago. I have kept it there in that safe place longer than needed. Getting the children grown, bidding too many loved ones goodbye, trying to figure out and adjust to my physical illness have required a holding pattern for me. No longer on the front lines of life, I would like to play a little. I would like to explore some creative work. I have always written. I have always taken photos. But, I want something more. Dare I take the risk to bear fruit? Yaupons bear fruit in the dead of winter. Bright red berries on bushes that are as varied in shape as snowflakes. Tenacious. Prolific. Beautiful. Life-giving to feathered creatures. Perhaps, I should hear the lesson. Bear fruit even in winter. Accept my unique sense of the world. Be tenacious. Be prolific. Give life to the feathered beauty of my imagination. Sometimes I still get topsy-turvy. I drop into depression. I don’t know what triggers it. I don’t know how deep it will go or how long it will stay. But, I do notice as I write this, I am referring to the depression as a separate entity. I am calling the depressed emotions “it”. This has only developed in the last couple of years. Previously, I identified myself as depressed. A couple of things I do for myself to treat the sadness are walking and acknowledgement. Walking is easy to explain. I have a route that takes about forty-five minutes to walk. There is a spot along the way I stop to voice praises and prayers and ask questions. I spend about five minutes doing this. I don’t struggle for answers. I try to do the walk several times each week. The second thing is acknowledgement. I see my emotional mood and my mental state. I notice how I am feeling the way I might notice the floor needs sweeping or the wash piling up. The sadness becomes a task to resolve. It (probably) is going to need doing again sometime. But, I know I can improve the issue before me now. I no longer fear that the sadness will go too deep and never go away. It has taken 30 years to learn to manage the depression. I don’t use medications or outside therapy. I rely on Him and him to watch over me. The rain falls. I cry. I hear a faint melody. The sun shines. I love. I see a ray of hope. The wind blows. I breathe. I know I will have another dance.